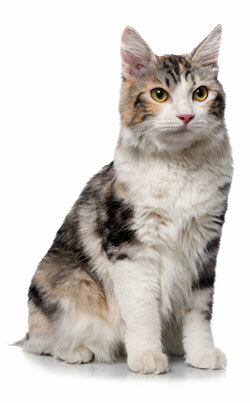 The Kurilian Bobtail is a cat breed originating from the Kuril Islands of Russia. It has a semi-cobby body type and a distinct short, fluffy tail. The backs are slightly arched with hind legs longer than the front, similar to that of the Manx. The Kurilian Bobtail is recognized by the World Cat Federation, The International Cat Association and the F�d�ration Internationale F�line but not the Cat Fanciers Association.